Anesthetized mice exhibit non-physiological systemic blood pressure, which precludes meaningful assessment of autonomic tone given the intimate relationship between blood pressure and the autonomic nervous system. Thus, a novel method to simultaneously record renal sympathetic nerve activity and blood pressure with intravenous infusion in conscious mice is outlined. Hamza, S. M., Hall, J. E. Novel Approach for Simultaneous Recording of Renal Sympathetic Nerve Activity and Blood Pressure with Intravenous Infusion in Conscious, Unrestrained Mice.. J. Vis. Exp. (132), e54120, doi:10.3791/54120 (2018). Renal sympathetic nerves contribute significantly to both physiological and pathophysiological phenomena. Evaluating renal sympathetic nerve activity (RSNA) is of great interest in many areas of research such as chronic kidney disease, hypertension, heart failure, diabetes and obesity. Unequivocal assessment of the role of the sympathetic nervous system is thus imperative for proper interpretation of experimental results and understanding of disease processes. RSNA has been traditionally measured in anesthetized rodents, including mice. However, mice usually exhibit very low systemic blood pressure and hemodynamic instability for several hours during anesthesia and surgery. Meaningful interpretation of RSNA is confounded by this non-physiological state, given the intimate relationship between sympathetic nervous tone and cardiovascular status. To address this limitation of traditional approaches, we developed a new method for measuring RSNA in conscious, freely-moving mice. Mice were chronically instrumented with radio-telemeters for continuous monitoring of blood pressure as well as a jugular venous infusion catheter and custom-designed bipolar electrode for direct recording of RSNA. Following a 48-72 hour recovery period, survival rate was 100% and all mice behaved normally. At this time-point, RSNA was successfully recorded in 80% of mice, with viable signals acquired up to 4 and 5 days post-surgery in 70% and 50% of mice, respectively. Physiological blood pressures were recorded in all mice (116±2 mmHg; n=10). Recorded RSNA increased with eating and grooming, as well-established in the literature. Furthermore, RSNA was validated by ganglionic blockade and modulation of blood pressure with pharmacological agents. Herein, an effective and manageable method for clear recording of RSNA in conscious, freely-moving mice is described. Interest in using mice in several areas of biomedical research continues to expand with the development of countless genetically engineered models. For the most part, technical advances have kept pace with the increased use of mice in physiology and there is now an impressive selection of miniaturized devices developed specifically for measuring important physiological parameters in mice. Although telemetric devices for direct measurement of autonomic nervous tone in the conscious rat have been available for over a decade, miniaturized devices for assessing nerve activity in conscious mice are currently not available. Investigators typically circumvent this limitation by evaluating the contribution of the autonomic nervous system with indirect methods (i.e. plasma or urine catecholamines, pharmacological autonomic blockade, spectral analysis of patterns of blood pressure/heart rate)1. While these approaches provide valuable information, the result is a global picture of overall autonomic tone, rather than revealing the discrete contribution of isolated populations of nerves to the phenomenon under investigation. Alternatively, direct recording of activity from specific nerves has been executed in anesthetized mice, which poses a multitude of concerns. It is exceedingly difficult to maintain stable blood pressure within the physiological range in an anesthetized mouse for several hours following surgery. In fact, in these types of experiments, blood pressure is often unreported or presented at extremely low levels (i.e. 60-80 mmHg vs >100mmHg in a conscious mouse)2. The fragility of the cardiovascular system exhibited in an anesthetized mouse preparation often precludes meaningful assessment of autonomic nerve activity, given the codependent relationship between blood pressure and sympathetic tone3,4. To address this limitation, a new method for direct recording of renal sympathetic nerve activity (RSNA) in conscious, unrestrained mice, undisturbed within their home cages was developed. Both the surgical and experimental approach for successful implementation of this technique is described in detail. This preparation enables the investigator to simultaneously record arterial pressure via radiotelemetry in addition to RSNA, with the added capability to intravenously infuse agents of interest without disturbing the mouse. Twenty four hours post-surgery, mice behave normally and do not exhibit signs of pain or distress. Experimental recordings may then commence 48 to 72 hours post-surgery while the mouse rests comfortably in its home cage with unrestricted access to food, water and environmental enrichment. Clear RSNA traces are presented and the characteristic responses of this nerve population to normal physical movements of the animal (such as eating and grooming) are demonstrated in addition to pharmacological modulation of systemic blood pressure. The quality and specificity of the RSNA signal is further validated by ganglionic blockade. This manuscript includes the audiovisual complement to an initially published description of this technique5. All of the experimental procedures are in accordance with the National Institutes of Health Guide for the Care and Use of Laboratory Animals and were approved by the Institutional Animal Care and Use Committee of the University of Mississippi Medical Center. House mice (24 - 35 g) upon arrival in the institutional laboratory animal facility. Offer mice standard rodent chow and tap water ad libitum at all stages of the experimental protocol in a temperature and humidity controlled environment. NOTE: Construct the implantable RSNA electrode at least a few days in advance of the scheduled surgical procedure to accommodate curing and sterilization time (described below). Cut three equal lengths of insulated stainless steel multiple-stranded wire, 250 mm each (wire diameter 0.0254 mm bare, 0.14 mm coated). Use a scalpel blade (preferably #11) to strip approximately 15 mm of the insulating material to expose the underlying metal from one end of each of the lengths of wire. Solder a single male pin connector (brass with gold plating) to the bared end of only two of the wires to create bipolar electrode leads (Figure 1A). Leave the end of the third length of wire bare. This will function as the ground wire. Slip a short (~2.0 - 2.5 cm) piece of 1.6 mm diameter heat-shrink tubing over the pin connector and wire to completely cover the newly soldered joint between the wire and pin connector. NOTE: The tip of the pin connector that will be plugged into the amplifier headstage must remain exposed. Hold the wire above a heat gun with a pair of small pliers or hemostats to shrink the heat-sensitive tubing and electrically insulate the connection between the pin connector and the wire. Repeat for the second wire/pin connector. Cut a 200 mm length of polyethylene tubing (PE 90; inner diameter 0.86 mm, outer diameter 1.27 mm). Group the three wires (two leads + ground wire) and introduce the untouched ends into the PE 90 tubing, threading them together through to the open end of the tubing (Figure 1B). NOTE: The PE 90 tubing functions as a sheath to group and protect the electrode leads and ground wire. Identify the ground wire and pull it through the PE 90 sheath a little further to distinguish it from the bipolar electrode leads. Visualize the untouched ends of the electrode wires with a dissecting microscope. Thread the three loose ends of the electrode through a 5 mm- long piece of smaller polyethylene tubing (PE 10, inner diameter 0.28 mm, outer diameter 0.61 mm) to bind the electrode wires together. Thread a 1.5 mm piece of this PE 10 tubing onto the three electrode wires. Advance this tubing to rest 2.0 mm away from the initial 5 mm piece of PE 10. Thread a second 1.5 mm piece of PE 10 tubing onto the tips of the two bipolar electrode leads to cover and insulate the tips and separate them from the ground wire (Figure 1C). Trim any excess length of the wires with scissors. Glue the individual pieces of PE 10 tubing to the electrode wires with a small drop of liquid formula cyanoacrylate glue. Place a blunted 25 gauge needle on the end of the glue tube to improve control and reduce spillage. Place the needle tip at the junction between the PE 10 and wire, then dispense a small drop of glue and visualize glue coating the inside of the PE tubing. Allow the glue to fully cure overnight. Strip the insulating coating from the bipolar electrode tips and the tip of the ground wire with a #11 scalpel blade. Do not disturb or damage the underlying multiple stranded wires as this will impact the quality of the RSNA signal. Grip the constructed electrode between the 5.0 mm and 1.5 mm PE 10 anchors with curved forceps and bend the wires to form a 90° angle (Figure 1D). NOTE: This maneuver should position the bipolar electrode leads above the ground wire, in an optimal position to cradle the nerve bundle. Construct a pedestal to stabilize the electrode leads to the mid-scapular region of the mouse upon exteriorization by cutting a 3 cm piece of polyethylene tubing (inner diameter 2.70 mm, outer diameter 4.00 mm). Grip the tubing with forceps and melt one end over a heat gun. Press the heated end of tubing perpendicular to a cool metal surface to create a rounded ridge or "flange". Thread this pedestal onto the constructed electrode, such that the flange is pointing toward the electrode tip. NOTE: The combination of the PE 90 sheath and pedestal will protect the electrode leads once exteriorized from the animal. Package the completed electrode individually in sterilization bags and ozone sterilize (TSO3) before implantation. NOTE: Consult with local hospital sterilization facility regarding specific type of sterilization bag and procedure as this differs between institutions. Administer analgesia 20 minutes prior to start of surgery (2 mg/kg meloxicam, S.C.). Place the mouse in an induction chamber infused with 100% medical grade oxygen. Adjust vaporizer settings to increase the percentage of isoflurane anesthetic in increments of 0.5 to reach 4%. Evaluate surgical plane by assessing the reflex response to gentle pressure applied to the toes or foot pads of fore and hind limbs as well as slowing of respiratory rate. Transfer the animal to the surgical table and maintain anesthesia with 1.5 to 2% isoflurane via a nosecone once it has reached surgical plane and no longer exhibits the toe-pinch reflex. Repeat the toe-pinch response periodically and assess respiratory rate throughout the entire surgical procedure. Apply ophthalmic ointment to eyes to prevent dryness. Maintain the animal's normal body temperature at all times with gel-filled isothermal heat pads and corresponding surgical table. Store isothermal pads in a 37°C water bath and replace pads as often as needed during surgery to maintain physiological body temperature. Administer glycopyrrolate (50 - 70 µg/kg, subcutaneously (S.C.)) to prevent excessive production of airway secretions immediately upon induction of anesthesia. Administer this dose of glycopyrrolate a second time at the midpoint of the surgical procedure (Step 9.1). Conduct all surgical procedures under aseptic conditions. Ensure all surgical tools have been autoclaved prior to scheduled surgery. Clean the surgical field as described below (7.2.1) and maintain sterility throughout the procedure. Wear a face mask, autoclaved isolation gown and sterile, single-use gloves. Clean all large equipment such as gooseneck lamp, dissecting scope and surgical table with 70% ethanol. Periodically during the procedure, apply 70% ethanol to the surgical gloves to ensure sterility. Remove hair from the animal's left flank, ventral neck region and dorsal midscapular region with small animal hair clippers followed by depilatory cream (sensitive skin formula). Cleanse the skin of these two surgical fields with 3 alternating applications of surgical cleansing solution (10% Povidone Iodine) and 70% ethanol. Prepare the surgical field with a final application of the surgical cleansing solution. Position the mouse on its right side with the rostral end pointing to the surgeon's left, exposing the animal's left flank. Make a 5 mm incision in the skin of the midscapular region with a scalpel (#11). NOTE: This is the site at which the RSNA electrode leads will be exteriorized. Make a second incision (<20 mm) in the skin overlying the left flank, perpendicular to the spine and 2 mm caudal to the ribcage. Tunnel a 13G stainless steel needle subcutaneously from this incision to the incision at the dorsal exit site. NOTE: File the sharp edges of the needle to leave a smooth, non-cutting edge. Pass the sterilized implantable RSNA electrode (Steps 2 - 6) through the 13G needle. Pull the 13G needle back to leave the electrode tip lying on the abdominal muscle of the left flank. Leave a segment of the electrode leads lying under the skin, and leave the remaining lengths emerging from the dorsal incision. Place the electrode tip to the side. Make an incision in the abdominal muscle directly underlying the skin incision made in 8.1.1. Separate the fat and connective tissue along the back muscle with small cotton-tipped applicators to expose the left kidney. Open the surgical field with micro-retractors and retract the kidney. Do not to stretch the renal neurovascular bundle, which will irreversibly damage the renal nerves and preclude recording of a viable RSNA signal. NOTE: Steel micro-retractors can be fashioned from a standard paper clip and a length of 4-0 silk. Ensure these retractors are also sterilized with the surgical instruments in order to preserve aseptic technique. Visualize the renal neurovascular bundle with the aid of a high power dissecting microscope. Identify the renal nerve bundle, which typically (but not always) runs alongside the renal artery and vein. Dissect the nerve bundle from the surrounding tissues with fine, straight forceps. NOTE: The renal nerve bundle appears opaque, with a "rope-like" reflective appearance, unique compared to the lymphatic vessels, which appear clear. Manipulate the nerve bundle as little as possible. Do not touch, stretch or pick up the nerve bundle at any time. Do not disrupt fine blood vessels supplying the nerve, or the renal lymph duct because this will compromise viability of the nerve and produce continuous lymph fluid pooling around the nerve/electrode, which will impede or completely obliterate the nerve signal. Leave the renal nerve bundle intact, which will help preserve long-term viability of the nerve as well as maintain stable contact between the nerve and the electrode (i.e. a sectioned nerve may slip off of electrodes with time and natural body movements). Introduce the RSNA electrode tip into the abdomen. Adjust its position such that the bipolar electrode tip and ground wire are perpendicular to the renal neurovascular bundle. Further adjust the position of the electrode such that the ground wire has good contact with underlying tissues and the electrode does not compress the renal vessels, compromising renal circulation (Figure 1D). Lift the renal nerve bundle with angled forceps. Slip the electrode tip underneath the nerve, leaving the nerve in direct contact with both wires. 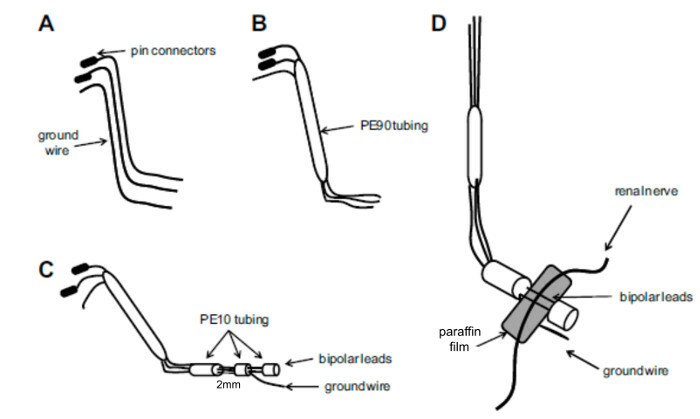 Slip a small piece of paraffin film between the nerve/bipolar wires and the third (ground) wire (Figure 1D). NOTE: Soak sterilize the paraffin film in 70% ethanol for 24 hours and rinse in sterile physiological saline prior to implantation. Remove any blood or fluid from around the nerve/electrode with small absorbent spears as any fluid left around the nerve or electrode wires will impede or extinguish the nerve signal. Quickly test the quality of the RSNA signal if desired (setup described below). NOTE: This must be done quickly as exposure to air will dry the nerve and compromise its viability. Apply a two-component silicone elastomer to the nerve/electrode unit, ensuring that the silicone pools under and around the nerve to provide complete electrical isolation (i.e. not simply a drop on top of the nerve). NOTE: Ensure the electrode tips are also coated in the silicone. The ground wire should remain in contact with the underlying tissue and thus elastomer does not need to pool underneath this wire. Avoid applying an unnecessarily large amount of the silicone elastomer, as this can potentially impede renal blood flow, or become dislodged with natural body movements with time. Allow 1-2 minutes for the silicone elastomer to cure completely, then carefully lift the outer edges of the silicone "glob" with forceps and apply a small amount of liquid formula surgical adhesive. NOTE: Take care not to apply an excessive amount of this glue, as it may impair circulation or spread to the nerve and compromise its viability. Close the abdominal incision with discontinuous, absorbable sutures (5-0). Close the overlying skin in a similar fashion with the same suture material. Reposition the mouse on its back, with the rostral end pointing toward the surgeon. Adjust anesthesia nosecone as needed. Administer the second dose of glycopyrrolate at this point (See 7.1.3). Make a midline incision in the skin of the neck region with a scalpel (#11), beginning from just below the animal's lower jaw and extending just above the ribcage. Separate the glandular tissue to expose the underlying neck muscles. Expose the left common carotid artery and separate from surrounding tissues. NOTE: Take great care not to damage the vagus nerve as this can lead to increased post-surgical mortality. Pass three pieces of 6-0 silk suture material underneath the artery. Position one suture as far rostrally as possible and tie it to occlude the vessel. Position a second suture midway along the length of the vessel and tie loosely. Position the last suture as caudally as possible and tie loosely. Retract the rostral-most suture and secure to the nosecone with a small piece of umbilical tape. Retract the caudal-most suture with micro-mosquito forceps to restrict blood flow in the vessel. Make a small incision in the vessel wall with fine spring scissors as rostrally as possible. Introduce the mouse blood pressure radiotelemeter catheter into the vessel and advance to the caudal suture. Tie the middle suture to temporarily stabilize the catheter, release the caudal retraction and advance the catheter 10 mm. Tie suture around catheter to secure in place. Tunnel the telemeter body to a subcutaneous pocket along the right flank. Use small cotton-tipped applicators to expose the right jugular vein. Pass two pieces of 6-0 silk suture material around the vessel. Position one suture as far rostrally as possible and tie to occlude the vessel. Position the second suture as caudally as possible and gently retract to stop blood flow in the vessel. Use fine spring scissors to make a small incision in the vessel wall as close to the rostral suture as possible. Catheterize the vein with heat-stretched tubing (O.D. 1.02 mm, stretched to OD 0.64 mm), which is pre- filled with sterile physiological saline. NOTE: Ensure the catheter tip is cut with a scalpel to produce a rounded bevel to prevent vessel perforation. Determine volume of fluid in the catheter (dead space) for reference (see steps 14.4-14.6 below). Advance the catheter ~8 mm into the vein. Secure the catheter by tying the silk sutures around the vessel and catheter, as well as application of a small drop of gel formula cyanoacrylate glue. Place the mouse on its left side. Tunnel the intravenous catheter from the neck to exit at the dorsal midscapular region using a 13G stainless steel needle. Reposition the mouse on his back. Close the neck incision with discontinuous sutures. Place the animal in the prone position. Thread a small subcutaneous button onto the venous catheter. Secure the button under the skin with sutures. Thread the corresponding stainless-steel spring over the venous catheter and secure it to the skin button to protect the catheter. Secure the polyethylene pedestal protecting the electrode leads to the underlying muscle with tissue adhesive. Suture the overlying skin over the flange for further support. Apply antibiotic ointment to all incisions. Administer analgesic medication. Administer additional doses of analgesic medication as needed during the recovery period if the animal shows signs of pain or distress. Place the mouse in a metabolic cage lined with wood chip bedding and paper towel to recover. Continually monitor the animal and do not leave it unattended until it regains consciousness and can maintain sternal recumbency. Introduce environmental enrichment and food and water (ad libitum) at this point. Coil electrode leads outside the cage until the time of the experiment. Place the cage over a warm heat pad for the first 24 hours of recovery. Connect stainless steel spring and intravenous catheter to a swivel/infusion system for continuous infusion of physiological saline during the recovery period (0.5 mL/hr). Ensure the animal remains singly housed in a dedicated cage due to the nature of the exteriorized catheter and electrode leads. Equip a stainless steel top anti-vibration table with a simple Faraday cage. NOTE: This Faraday cage can be constructed with a wooden frame and aluminum screen mesh. Electrically ground the table/Faraday cage to eliminate any electrical noise. Place a blood pressure radiotelemetry receiver within the Faraday cage. Connect the radiotelemetry receiver to the associated pressure output adapter. Connect this adapter to a data acquisition system to record blood pressure online. Solder two female pin connectors that are complimentary to the electrode male pin connectors (brass with gold plating) to the ends of a paired, shielded PVC insulated cable. Solder the opposite ends of this paired cable to banana plugs. Connect the banana plugs to a preamplification headstage (10X amplification). Connect this preamplifier to a differential amplifier. Adjust settings to amplify to nerve signal x10, 000. Adjust filter settings as follows: Low cut, 100Hz; High cut, 1000 Hz. Place the home cage containing the mouse onto the radiotelemetry receiver located within the Faraday cage 48 to 72 hours after surgery. Turn on the radiotelemetry probe to record blood pressure signals. NOTE: Acclimating the mouse by placing the home cage in the setup over the course of 1 week prior to surgery is optimal. Uncoil the electrode leads and plug the pin connectors of the bipolar electrode into corresponding female pin connectors described above (13.4) to begin recording RSNA. Display and simultaneously record blood pressure signals online with a computer, while infusing physiological saline or solution of interest. Record data at a minimum rate of 2500 samples per second. Ensure mice are comfortable in their home cage, unrestrained with free access to food and water. Follow institutional animal care guidelines for verifying normal appearance and behavior. House the mice in the same temperature and humidity controlled room in which RSNA recording will take place. Ensure intravenous infusion continues as described above. Allow at least 30 minutes of stabilization once the animal is situated in the recording setup described above before recording one hour of baseline blood pressure and RSNA data. Ensure the animal is resting quietly during recording since natural movement is associated with increase in sympathetic tone. Note when the animal is moving directly on the digital trace during recording so this can be disregarded during analysis. Test the baroreflex response by first slowly injecting a bolus of sodium nitroprusside (2.5 µg/g of body weight in a volume of 25 µL of saline) into the infusion line. Slowly flush the line with ~50 µL physiological saline. Ensure catheter dead space is cleared. Record blood pressure and RSNA for 2 to 5 minutes. Slowly inject a bolus of phenylephrine (20 µg/g of body weight in 25 µL of saline). Flush with ~50 µL physiological saline. Ensure catheter dead space is cleared. Record blood pressure and RSNA for a further 10 to 15 minutes. Verify the postganglionic nature of the nerve signal by slowly injecting a bolus of the ganglionic blocker, hexamethonium (50 µg/g body weight in 25 µL saline) into the infusion line. Flush with ~50 µL saline. Ensure catheter dead space is cleared. Continue recording for several minutes. Use the residual activity that remains after hexamethonium administration as an estimation of background noise for use in the analysis of RSNA (described below). Euthanize the mouse with an overdose of isoflurane (stepwise dosage in increments of 0.5 up to 5%) and continue recording RSNA for a further 30 minutes. Note: The remaining signal may also be used as an estimation of background noise for analysis of RSNA. Use data acquisition software to analyze raw blood pressure and RSNA traces. Digitally integrate and full-wave rectify the raw RSNA trace using this software. Select "Absolute Integral" for integral settings; apply a time constant decay of 0.1 seconds6. Analyze the integrated RSNA signal (displayed in units of µV·s) for each segment of the experimental protocol. Disregard segments of the recording when the animal happened to be moving. 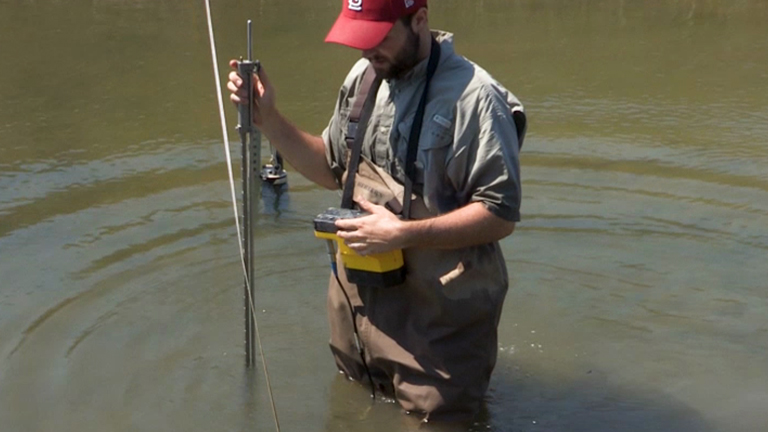 Take at least 3 measurements for baseline and experimental portions of the experiment, respectively. Analyze RSNA at the minimum and maximum blood pressure level achieved for sodium nitroprusside or phenylephrine, respectively to assess baroreflex sensitivity. Average the individual measurements taken above for each portion of the experimental protocol to yield a single value. Quantify the RSNA response by calculating the percentage change of RSNA from baseline, which is designated at 100%7. Complete statistical analysis as appropriate. NOTE: In this example, statistical analysis of the response of RSNA to sodium nitroprusside and phenylephrine was completed with a Student's t test; significance was accepted with P values <0.05. Following the described protocol, survival rate was 100% - all mice instrumented in this study survived and recovered well following the surgical procedure. Within 24 hours of surgical preparation, all mice behaved normally, exhibiting typical eating, grooming and exploratory behaviors. No animals showed any sign of pain or distress at this time. 48 hours following surgery, a verifiable and clear RSNA signal was recorded in 10 out of the 12 mice. This signal was maintained in these mice 72 hours post-surgery, however a true RSNA signal was recorded in 7 (70%) of mice by day 4 and in only 5 (50%) mice by day 5 post-surgery. Mice that did not exhibit a high-quality RSNA signal due to electrical noise or contamination by electrocardiogram signals were still in good health until the time of euthanization. Mean arterial pressure in the conscious mice 48 hours post-surgery was 116±2 mmHg, with a corresponding mean heart rate of 596±22 bpm (n=10). Simultaneous recording of a representative sample of blood pressure and RSNA at this time demonstrated clearly visible and characteristically rhythmic bursts of RSNA (Figure 2). The typical increases of RSNA expected with normal activities such as eating and grooming, as directly observed and noted by personnel, were also present (Figure 3). High-quality RSNA was also recorded sequentially in 50% of the mice under investigation up to 5 days after surgical preparation (Figure 4). Blood pressure and heart rate remained stable for the 5 day investigation period and values were not different from those we have recorded following up to 10 days of post-surgical recovery (Table 1)8. To validate the RSNA signal and verify that it is indeed entrained with the arterial baroreflex, blood pressure was pharmacologically manipulated with an intravenous injection of sodium nitroprusside and phenylephrine. 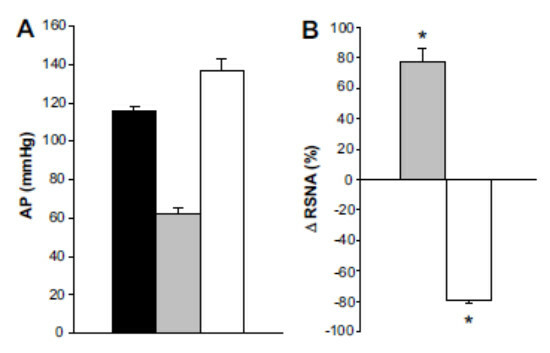 RSNA characteristically increased in response to the sodium nitroprusside-induced reduction of arterial pressure; conversely, RSNA was virtually silenced following the phenylephrine-induced increase in arterial pressure (Figure 5). Quantitatively, sodium nitroprusside decreased blood pressure to 62±3 mmHg, which corresponded to an elevation of RSNA to 77±9% above baseline levels (n=5; P<0.05, Figure 6). Similarly, following phenylephrine administration, arterial pressure reached 137±6 mmHg, which reduced RSNA by 79±2% below baseline level (n=5; P<0.05, Figure 6). Furthermore, RSNA was completely eliminated following ganglionic blockade with hexamethonium (Figure 7), establishing the post-ganglionic nature of the RSNA signal. Figure 1: Construction and placement of the implantable renal sympathetic nerve electrode. Schematic depiction of the design and recommended placement of the implantable renal sympathetic nerve electrode. (A) Bipolar leads fitted with pin connectors and a third ground wire. (B) Wires are threaded through polyethylene (PE) 90 tubing to protect the exteriorized leads. (C) Design of the electrode tip in order to separate the bipolar leads from the ground wire. (D) Electrode tip is bent at a 90° angle to facilitate optimal position; the renal nerve bundle is placed perpendicular to the bipolar leads and wax-based laboratory film insulates the leads from the ground wire that is in contact with the underlying tissue. Reproduced with permission5. Please click here to view a larger version of this figure. Figure 2: Representative recording of arterial pressure and renal sympathetic nerve activity (RSNA). Sample trace demonstrating simultaneous recording of systemic arterial blood pressure, RSNA and integrated RSNA in a conscious, quietly resting mouse 48 hours following surgical preparation. Reproduced with permission5. Please click here to view a larger version of this figure. Figure 3: Response of renal sympathetic nerve activity (RSNA) to normal physical activity. Representative trace featuring simultaneous recording of systemic arterial blood pressure, RSNA and integrated RSNA in two conscious mice 48 and 72 hours following surgery at baseline and (A) upon commencement of active grooming or (B) quiet eating. The large arrow denotes commencement of the physical activity from rest. Reproduced with permission5. Please click here to view a larger version of this figure. Figure 4: Long-term renal sympathetic nerve activity (RSNA) signal viability. Sequential representative recordings of blood pressure and RSNA in one conscious, quietly resting mouse several days following surgical preparation. (A) 2 days, (B) 3 days, (C) 4 days and (D) 5 days post-surgery. Please click here to view a larger version of this figure. Figure 5: Entrainment of the renal sympathetic nerve activity (RSNA) signal with the arterial baroreflex. 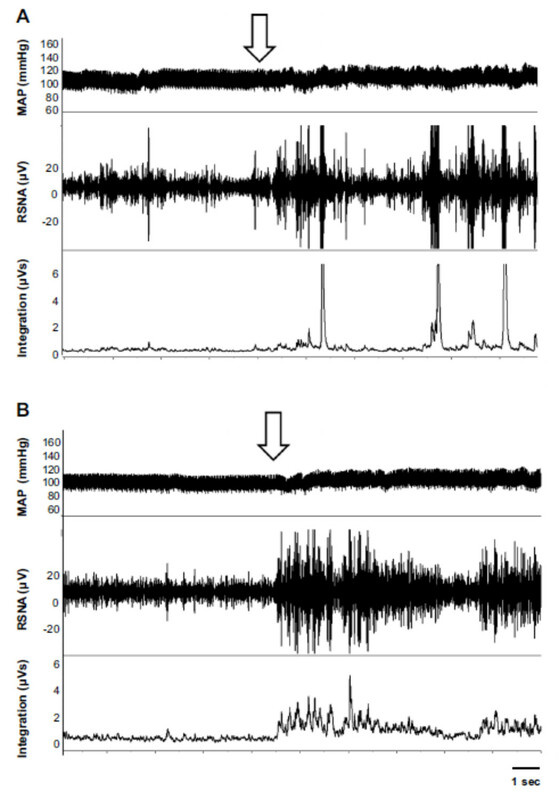 Representative recording of arterial blood pressure and RSNA in a conscious mouse at rest during (A) baseline and after subsequent intravenous administration of (B) sodium nitroprusside followed by (C) phenylephrine. Reproduced with permission5. Please click here to view a larger version of this figure. Figure 6: Quantitation of renal sympathetic responsivity to arterial blood pressure. Quantitative response of arterial blood pressure and renal sympathetic nerve activity (RSNA) to pharmacological manipulation with sodium nitroprusside and phenylephrine. (A) Mean arterial pressure at baseline (black bar; 116±2 mmHg) and following subsequent intravenous administration of sodium nitroprusside (grey bar; 62±3 mmHg) and phenylephrine (open bar; 137±6 mmHg). (B) Corresponding RSNA response during sodium nitroprusside (grey bar; 77±9%) or phenylephrine (open bar; -79±2%). RSNA is expressed a percent change from baseline, mean ± SEM. *Significant difference from baseline (p<0.05, n=5). Reproduced with permission5. Please click here to view a larger version of this figure. Figure 7: Post-ganglionic nature of renal sympathetic nerve activity (RSNA). 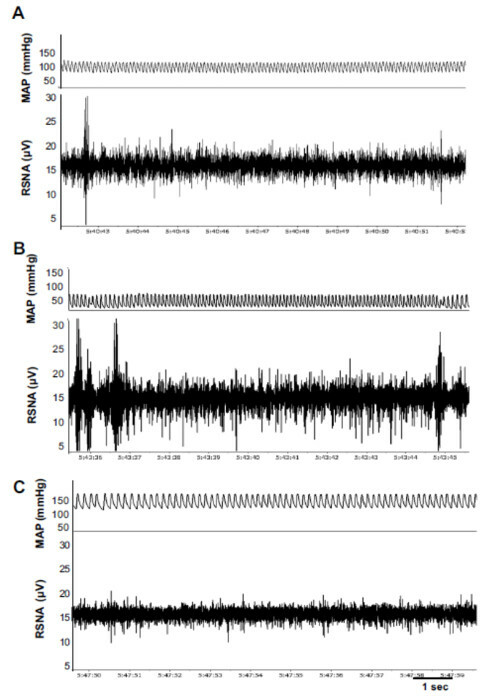 Representative trace of arterial blood pressure and RSNA at (A) baseline, (B) immediately following ganglionic blockade with hexamethonium and (C) post-mortem. Reproduced with permission5. Please click here to view a larger version of this figure. Table 1: Baseline mean arterial pressure and heart rate values in instrumented mice over 5 consecutive days following surgery. Reproduced with permission5. Herein we have outlined, demonstrated and validated a novel method for targeted evaluation of RSNA in conscious mice, free to move and rest comfortably in their home cages. Following surgical implantation of an arterial pressure radiotelemeter, an indwelling intravenous infusion catheter and a custom-designed bipolar RSNA electrode, mice recovered from surgery and were left undisturbed for 48 to 72 hours. Mice remained comfortably settled in their home cage at all times (including experimental periods) with unrestricted access to food, water and environmental enrichment. All ensuing experimental manipulation by the investigator was remote and did not disquiet the animals. Regarding the quality and interpretation of the RSNA signal, this approach completely removed the undesirable and unavoidable physiological complications of anesthesia and surgical trauma as well as restraint and other sources of physical and mental stress to the animal. Thus, these serious confounding factors which invariably impact the interpretation of sympathetic nerve activity measurements were effectively eliminated. All mice were in good health and as early as 24 hours post-surgery, displayed typical behaviors such as brightness, activity, responsiveness, eating, drinking, grooming as well as playful and exploratory behavior. All animals exhibited these characteristics and actively engaged with the provided environmental enrichment regardless of whether or not a viable RSNA signal was able to be recorded. Although the recovery time required to completely restore normal blood pressure following implantation of the radiotelemetric probe is reportedly as long as 4-7 days9, arterial pressure returns to normal much sooner, as demonstrated by the values reported here for blood pressure and heart rate. Indeed, these cardiovascular parameters are equivalent to those previously reported in similarly instrumented animals which were allowed up to 10 days to recover from surgery8,10. The choice to use radiotelemetric probes for blood pressure measurement over a fluid-filled catheter was deliberate, as this reduces stress in the mice and also yields more clear and reliable blood and pulse pressure signals and heart rate values11. Using telemetric technology to record blood pressure poses an additional advantage since the need to frequently flush and maintain the fluid filled arterial catheter with heparinized saline, which inevitably disturbs the animal, is completely eliminated. Also, the approach of surgically exteriorizing, anchoring and protecting the intravenous catheter and bipolar electrode leads is ideal compared to other reports describing temporary storage of leads in a subcutaneous pocket12, since our approach avoids even brief re-anesthesia and surgical manipulation of the animal immediately before experimental recording, which would undoubtedly perturb the mouse and compromise the quality and interpretability of exquisitely sensitive autonomic nervous system data. This method yields true RSNA signals, the quality of which are demonstrated by the characteristic bursts of electrical activity clearly distinguishable from background noise in a relaxed, quietly resting mouse. In addition, RSNA showed typical responsiveness to physical activity in the animal such as grooming and quiet eating as reported in the literature13,14. Given the characteristic increases in RSNA expected with natural movement or alertness of the animal, it is thus imperative to note and exclude these periods of time for the purpose of experimental analysis and to focus on segments of the recording during which the animal is quietly resting. This helps to prevent possible misinterpretation of the data. Other factors which can lead to data misinterpretation include electrical noise or interference, as well as signal contamination with ECG pulses15. Excessive movement of the exteriorized portion of the electrode leads can also influence the quality of the RSNA signal and can appear as an unstable or "wavering" baseline. At times these sources of signal interference can appear and spontaneously disappear during a perfectly clear recording and should be excluded from analysis5,15,16. An additional consideration is the time at which the recordings are obtained. It is important to note that blood pressure and RSNA do vary with the circadian rhythm, so it is ideal to conduct experiments at the same time of the day to avoid this potentially confounding factor. In this study, we did not observe significant variability of blood pressure and RSNA due to circadian oscillations as we recorded all parameters between 10 am and 6 pm - well within the daylight cycle of the animal housing facility. Another important component of this report is the validation of the RSNA signal, which as demonstrated, is indeed entrained with the arterial baroreflex. Given the rapid reduction and elevation of RSNA in parallel with the pharmacologically-induced drop and increase in systemic blood pressure, the arterial baroreflex was most certainly intact - which itself demonstrates that occlusive implantation of the radiotelemetry catheter in one carotid artery does not interfere with normal cardiovascular function. The virtual disappearance of the RSNA signal upon ganglionic blockade with hexamethonium further confirms recording of postganglionic RSNA. It would be ideal to provide a longer post-surgery recovery period for the mice, however we and others in this field recognize that maintaining long-term viability of autonomic nerves in chronically instrumented animals, especially mice, remains challenging. Although the RSNA signal quality diminished over the course of several days post-surgery, it was still possible to reliably record true RSNA for at least 3 consecutive days in all mice and for up to 5 days in about half of the animals. This accomplishment in itself signifies a breakthrough in the field of autonomic studies in mice. Furthermore, this method maximizes the use of precious transgenic animals, as it is possible to record multiple experimental and control trials in the same animal on different days, of course, allowing for randomization of trial order and proper baseline recording before each experiment17. It is encouraging to see successful reports of long-term sympathetic nerve recordings conducted in conscious rodents18,19,20 including advancements in telemetric nerve recording technologies for rats15,21. Miniaturization of this technology for use in the conscious mouse is forthcoming and in the meantime, we strive to improve this technique to increase the longevity of the sympathetic nerve fibers to extend the experimental window and perhaps permit a longer post-surgery recovery time. However, this method will remain a useful and readily accessible and affordable alternative/complement to any future developments in telemetric nerve recording technology in mice, which do require an investment in dedicated equipment and regular device maintenance. 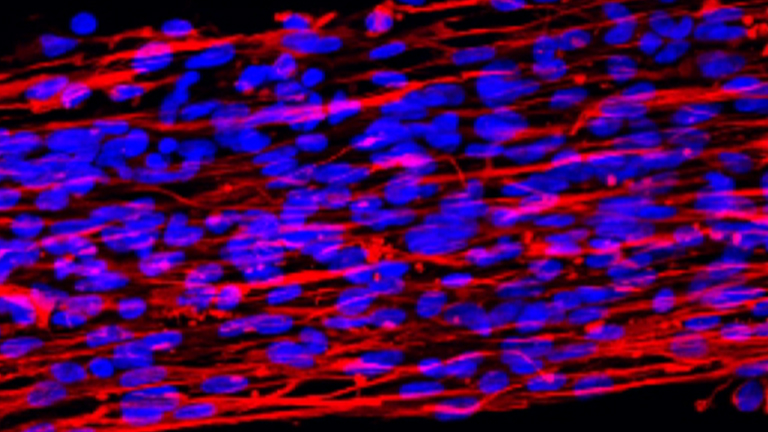 The need for reliable techniques for assessing cardiovascular and autonomic function in mice has never been so great, considering the ever-growing interest in transgenic mouse models in the field of biomedical research. Great strides have been made in many areas of physiology, however there is still far to go in terms of standardizing and optimizing approaches for evaluating autonomic function in the mouse. To date, there is one report describing measurement of sensory nerve activity in the conscious mouse12. This approach outlines the measurement of bladder sensory nerve activity and involves anesthesia and surgical manipulation of subcutaneously placed catheters immediately before experimental recording as well as physical restraint of the mice during the course of the experimental protocol12. These factors are known stressors that are completely avoided with the present approach, which can certainly be tailored for recording of a variety of nerves of interest in addition to renal nerves. More recently, sympathetic nerve measurements in conscious mice have been reported, however, these measurements are largely conducted hours following surgical preparation, with no mention of analgesic administration22. Aside from these reports, autonomic function has been otherwise assessed exclusively in anesthetized mice. A thorough review of the literature yields a multitude of approaches, hours-long experimental duration, anesthetic combinations/doses, mechanical ventilation and often creative measures taken to sustain the mice in a state bearing some semblance to the physiological (i.e. oxygen blown directly toward the animal's nose)23,24,25,26,27,28,29,30,31. Amongst these studies, reports of blood pressure values are absent, or abysmally low - below the physiological range of systemic arterial pressures2. This is problematic on many levels, but especially so when proper assessment of autonomic function in these animals is concerned, given the established link between blood pressure and autonomic tone. Anesthetic agents themselves directly impact sympathetic tone, with many reports suggesting that anesthesia dampens sympathetic activity. Indeed, evidence demonstrate that urethane, the most widely chosen anesthetic for acute nerve recording experiments32, dose dependently decreases RSNA33 and inhibits the arterial baroreflex34. Conversely, other reports suggest that urethane increases sympathetic tone35. Granted, such studies typically compare experimental nerve activity as a change from a recorded baseline, however the altered state of the autonomic nervous system under the above-described conditions undeniably precludes detection of discrete changes in nerve activity. The challenge of this method lies mainly in the surgical skill required for successful preparation of the mouse for conscious nerve recording. However the investment in honing these skills is more than compensated by the quality and reliability of the direct RSNA data produced. This approach completely circumvents the limitations posed by indirect assessments of autonomic control such as plasma catecholamine levels, which are quite labile in mice and are limited by the amount of blood that may be humanely collected36. In addition, plasma catecholamine level as well as pharmacological autonomic blockade estimate overall autonomic tone1 as opposed to the discrete contributions of specific nerve populations, which are generally of more interest. Mathematic evaluation of autonomic tone via power spectral analysis of blood pressure and heart rate traces is useful for evaluating autonomic function in human subjects, however this technique may not be adaptable for mice36,37. Therefore, direct sampling of nerve activity in a conscious, comfortably resting mouse is ideal as it closely reflects the natural, intact autonomic status of the subject and facilitates sophisticated evaluation of the contribution of selected nerves to physiological phenomena of interest. S.M.H. was supported by postdoctoral fellowships from the Canadian Institutes for Health Research (CIHR), Heart & Stroke Foundation of Canada (HSFC) and Alberta Innovates Health Solutions (AiHS); J.E.H. is supported by a grant from the National Heart, Lung and Blood Institute PO1HL-51971. Young, C. N., Davisson, R. L. In vivo assessment of neurocardiovascular regulation in the mouse: principles, progress, and prospects. Am J Physiol Heart Circ Physiol. 301, (3), H654-H662 (2011). Kass, D. A., Hare, J. M., Georgakopoulos, D. Murine cardiac function: a cautionary tail. Circ Res. 82, (4), 519-522 (1998). Charkoudian, N., Wallin, B. G. Sympathetic neural activity to the cardiovascular system: integrator of systemic physiology and interindividual characteristics. Compr Physiol. 4, (2), 825-850 (2014). Guyenet, P. G. The sympathetic control of blood pressure. Nat Rev Neurosci. 7, (5), 335-346 (2006). Hamza, S. M., Hall, J. E. Direct recording of renal sympathetic nerve activity in unrestrained, conscious mice. Hypertension. 60, (3), 856-864 (2012). DeBeck, L. D., Petersen, S. R., Jones, K. E., Stickland, M. K. Heart rate variability and muscle sympathetic nerve activity response to acute stress: the effect of breathing. Am J Physiol Regul Integr Comp Physiol. 299, (1), R80-R91 (2010). Krowicki, Z. K., Kapusta, D. R. Microinjection of glycine into the hypothalamic paraventricular nucleus produces diuresis, natriuresis, and inhibition of central sympathetic outflow. J Pharmacol Exp Ther. 337, (1), 247-255 (2011). do Carmo, J. M., et al. Control of blood pressure, appetite, and glucose by leptin in mice lacking leptin receptors in proopiomelanocortin neurons. Hypertension. 57, (5), 918-926 (2011). Brockway, B. P., Mills, P. A., Azar, S. H. A new method for continuous chronic measurement and recording of blood pressure, heart rate and activity in the rat via radio-telemetry. Clin Exp Hypertens A. 13, (5), 885-895 (1991). Tallam, L. S., Silva, da, A, A., Hall, J. E. Melanocortin-4 receptor mediates chronic cardiovascular and metabolic actions of leptin. Hypertension. 48, (1), 58-64 (2006). Van Vliet, B. N., Chafe, L. L., Antic, V., Schnyder-Candrian, S., Montani, J. P. Direct and indirect methods used to study arterial blood pressure. J Pharmacol Toxicol Methods. 44, (2), 361-373 (2000). Zvara, P., et al. A non-anesthetized mouse model for recording sensory urinary bladder activity. Front Neurol. 1, 127 (2010). Hagan, K. P., Bell, L. B., Mittelstadt, S. W., Clifford, P. S. Effect of dynamic exercise on renal sympathetic nerve activity in conscious rabbits. J Appl Physiol. 74, (5), 2099-2104 (1985). Matsukawa, K., Ninomiya, I. Changes in renal sympathetic nerve activity, heart rate and arterial blood pressure associated with eating in cats. J Physiol. 390, 229-242 (1987). Stocker, S. D., Muntzel, M. S. Recording sympathetic nerve activity chronically in rats: surgery techniques, assessment of nerve activity, and quantification. Am J Physiol Heart Circ Physiol. 305, (10), 6 (2013). Burke, S. L., Lambert, E., Head, G. A. New approaches to quantifying sympathetic nerve activity. Curr Hypertens Rep. 13, (3), 249-257 (2011). Smith, F. G. Techniques for recording renal sympathetic nerve activity in awake, freely moving animals. Methods. 30, (2), 122-126 (2003). Miki, K., Kosho, A., Hayashida, Y. Method for continuous measurements of renal sympathetic nerve activity and cardiovascular function during exercise in rats. Exp Physiol. 87, (1), 33-39 (2002). 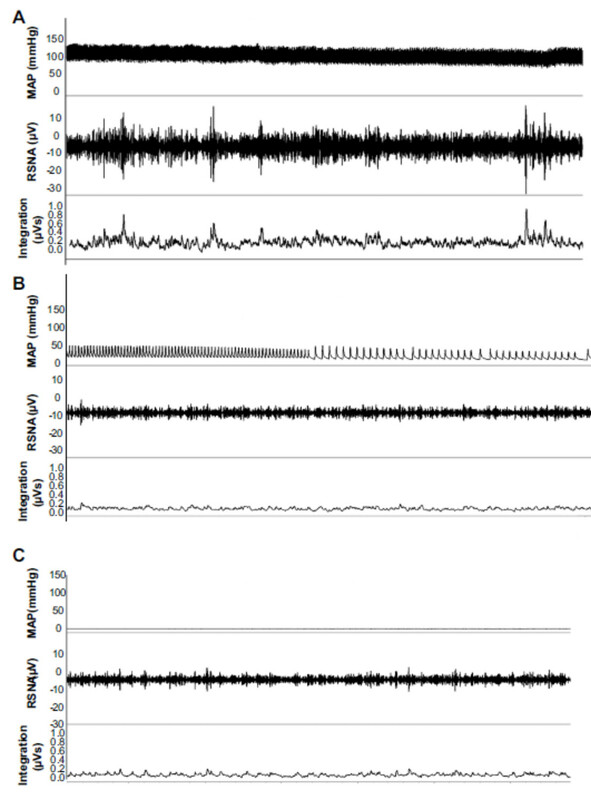 Yoshimoto, M., Miki, K. Measurement of renal sympathetic nerve activity in freely moving mice. J Physiol. 560, (2004). 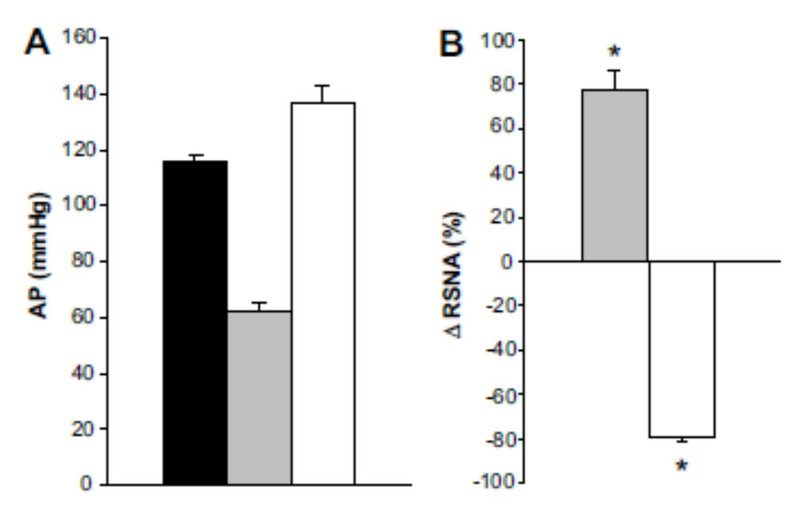 Yoshimoto, M., Miki, K., Fink, G. D., King, A., Osborn, J. W. Chronic angiotensin II infusion causes differential responses in regional sympathetic nerve activity in rats. Hypertension. 55, (3), 644-651 (2010). Salman, I. M., Sarma Kandukuri,, Harrison, D., L, J., Hildreth, C. M., Phillips, J. K. Direct conscious telemetry recordings demonstrate increased renal sympathetic nerve activity in rats with chronic kidney disease. Front Physiol. 6, 218 (2015). Morgan, D. A., Despas, F., Rahmouni, K. Effects of leptin on sympathetic nerve activity in conscious mice. Physiol Rep. 3, (9), (2015). Alfie, M. E., Sigmon, D. H., Pomposiello, S. I., Carretero, O. A. Effect of high salt intake in mutant mice lacking bradykinin-B2 receptors. Hypertension. 29, (1 Pt 2), 483-487 (1997). Dietz, J. R., Landon, C. S., Nazian, S. J., Vesely, D. L., Gower, W. R. Effects of cardiac hormones on arterial pressure and sodium excretion in NPRA knockout mice. Exp Biol Med (Maywood). 229, (8), 813-818 (2004). Zhang, W., et al. Cyclosporine A-induced hypertension involves synapsin in renal sensory nerve endings. Proc Natl Acad Sci U S A. 97, (17), 9765-9770 (2000). Szczesny, G., Veihelmann, A., Massberg, S., Nolte, D., Messmer, K. Long-term anaesthesia using inhalatory isoflurane in different strains of mice-the haemodynamic effects. Lab Anim. 38, (1), 64-69 (2004). Tank, J., et al. Sympathetic nerve traffic and circulating norepinephrine levels in RGS2-deficient mice. Auton Neurosci. 136, (1-2), 52-57 (2007). Schwarte, L. A., Zuurbier, C. J., Ince, C. Mechanical ventilation of mice. Basic Res Cardiol. 95, (6), 510-520 (2000). Zuurbier, C. J., Emons, V. M., Ince, C. Hemodynamics of anesthetized ventilated mouse models: aspects of anesthetics, fluid support, and strain. Am J Physiol Heart Circ Physiol. 282, (6), H2099-H2105 (2002). Farnham, M. M., O'Connor, E. T., Wilson, R. J., Pilowsky, P. M. Surgical preparation of mice for recording cardiorespiratory parameters in vivo. J Neurosci Methods. 248, 41-45 (2015). 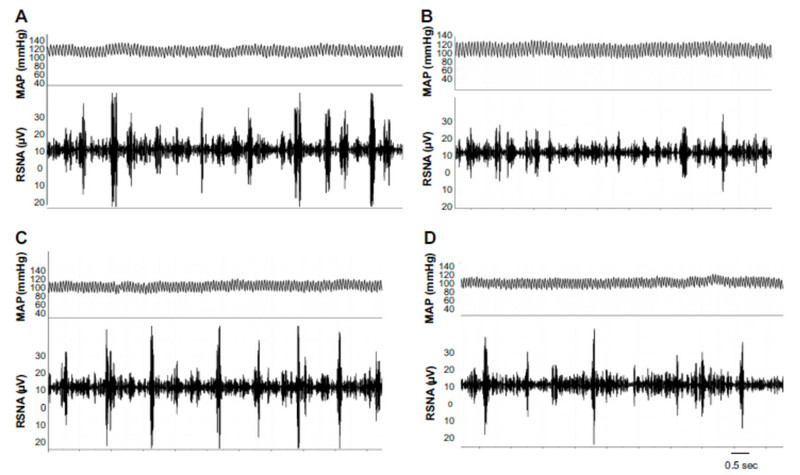 Cuellar, J. M., Antognini, J. F., Carstens, E. An in vivo method for recording single unit activity in lumbar spinal cord in mice anesthetized with a volatile anesthetic. Brain Res Brain Res Protoc. 13, (2), 126-134 (2004). Carruba, M. O., Bondiolotti, G., Picotti, G. B., Catteruccia, N., Da Prada, M. Effects of diethyl ether, halothane, ketamine and urethane on sympathetic activity in the rat. Eur J Pharmacol. 134, (1), 15-24 (1987). Wang, G. F., Mao, X. J., Chen, Z. J. Urethane suppresses renal sympathetic nerve activity in Wistar rats. Eur Rev Med Pharmacol Sci. 18, (10), 1454-1457 (2014). Xu, H., et al. Effects of induced hypothermia on renal sympathetic nerve activity and baroreceptor reflex in urethane-anesthetized rabbits. Crit Care Med. 28, (12), 3854-3860 (2000). Shimokawa, A., Kunitake, T., Takasaki, M., Kannan, H. Differential effects of anesthetics on sympathetic nerve activity and arterial baroreceptor reflex in chronically instrumented rats. J Auton Nerv Syst. 72, (1), 46-54 (1998). Janssen, B. J., Smits, J. F. Autonomic control of blood pressure in mice: basic physiology and effects of genetic modification. Am J Physiol Regul Integr Comp Physiol. 282, (6), R1545-R1564 (2002). Nunn, N., Feetham, C. H., Martin, J., Barrett-Jolley, R., Plagge, A. Elevated blood pressure, heart rate and body temperature in mice lacking the XLalphas protein of the Gnas locus is due to increased sympathetic tone. Exp Physiol. 98, (10), 1432-1445 (2013).